Burmester produces an outstanding range of Colheita Ports. These are ports from a single harvest that have been barrel-aged for many years until bottling. They have developed amazing flavours of caramel, nuts and spices. Served slightly chilled, they are a fabulous drink on its own or an amazing accompaniment to sweet desserts. Founded in 1730 by John Burmester and Henry Nash as a cereal trading company, they moved to Oporto in 1750 to bring port into the UK. The company quickly developed a good reputation and by the late 1800's was considered to be in the first rank of producers. However, the company floundered after the First World war before being acquired by two Brothers from the Burmester Family who turned round its fortunes. Today the brand is owned by Sogevinous, the Owners of Kopke, Calem and Barros. Burmester ports have developed a strong reputation throughout Europe and the US. However, the brand is practically unknown in the UK market which is dominated by just a few Shippers. We are proud to reintroduce this amazing brand back into the UK. The Burmester Vintage Port 2016 is loaded with character and enormous ageing potential. From a fully declared year, this port is elegant and fragrant, with a touch of balsamic, a firm structure, aromas of ripe fruit and excellent acidity with a very long finish. The vineyard of Quinta do Arnozelo is situated on the southern bank of the Douro river, between the small towns of São João da Pesqueira and Vila Nova de Foz Côa. This is in the prestigious upper reaches of the Douro demarcated wine region, the aptly named Douro Superior. In addition to its favourable geographic location, it has an ideal micro-climate, both of which contribute to the superior quality of its grapes and other produce. The vineyard has 200ha, comprised of vines, olive trees, orange trees and forest (which harbours a large variety of the region’s species). The aromas are delicate and varied, with plenty of tropical fruit, berries and grapes fully ripe. In its evolution are noticeable aromas of cocoa, chocolate and a slight toasted wood. The palate is dense and opaque. Red and black fruit in the aroma, with much youth, blackberry compote. Very attractive in the mouth, elegant and with a beautiful presence, it proves very lively and fresh with citrus notes to mark presence. Will mature over the next 10-15 years. The 2011 Burmester Vintage Port is, according to Kim Marcus (Wine Spectator), an "intensely fruity" wine with great complexity and concentration, notes of "raspberries, black plums and wild cherries." This wine offers a "refined finish" with a touch of "dark chocolate, tea and brown sugar." It is a wine that, according to the critic, is ready to drink but has the ability to continue ageing during the next three decades. Since the beginning of the 20th century, all Vintages are bottled in the cellars at Vila Nova de Gaia during the second spring after the harvest. Produced according to the traditional method of foot treading in classic stone "lagares", a Vintage is only declared in years of outstanding and exceptional quality. Mature orange colour and seductive aromas of fruit cake, honey and a touch of spice. Mellifluous, smooth and suave palate yet beautifully fresh with a dusting of tannic spice on the finish. This port is made from old vines, being submitted to a careful ageing process in small oak casks. Over its 250-year history, Casa Burmester has perfected the classic process of blending wines and this is a magnificent example of its expertise. The 2005 Burmester colheita port is a classic wine of exceptional quality and elegance. 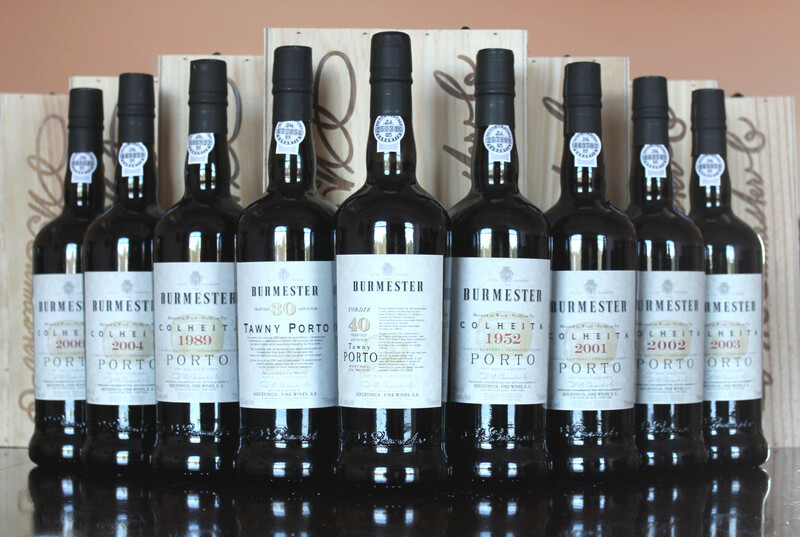 Burmester is a Port Wine brand with centuries of history in producing some of the best Ports.Their barrel aged single harvest port offers a complex nose with raisins, dried prunes and hazelnut notes. Full-bodied with a great balance, a smooth palate that reflects the nose and a fine long length. The 2004 Colheita has a Complex nose with dark berries, cress, coffee Full-bodied and great balance. Smooth palate that reflects the nose. Very good length. The 2004 Burmester Colheita Port is a classic wine of exceptional quality and elegance. The Port is made from a single harvest (a "Vintage Tawny") and aged in small 550-litre oak barrels in their Vila Nova de Gaia Cellars. It is bottled at least seven years after the harvest. The 2003 Colheita has a Complex nose with dark berries, cress, coffee Full-bodied and great balance. Smooth palate that reflects the nose. Very good length. The 2003 Burmester Colheita Port is a classic wine of exceptional quality and elegance. The Port is made from a single harvest (a "Vintage Tawny") and aged in small 550-litre oak barrels in their Vila Nova de Gaia Cellars. It is bottled at least seven years after the harvest. The 2002 Burmester Colheita Port is a classic wine of exceptional quality and elegance. The Port is made from a single harvest (a "Vintage Tawny") and aged in small 550-litre oak barrels in their Vila Nova de Gaia Cellars. It is bottled at least seven years after the harvest. The 2002 Colheita has a Complex nose with dark berries, cress, coffee Full-bodied and great balance. Smooth palate that reflects the nose. Very good length. Burmester 20 Year Old Tawny Port has plenty of sweet fruits and ripe dark brown sugar and raisins. The aftertaste shows more of the wood ageing, giving sweet vanilla and nutty flavours. Burmester 20 Year Old Tawny Port is made from old vines, being submitted to a careful ageing process in small oak casks. Over its 250-year history, Casa Burmester has perfected the classic process of blending wines and this is a magnificent example of its expertise. Our notes: Beautifully ripe red and dark berry fruits and violets in the nose and the mouth. Pleasantly sweet and smooth. Good acidity and fine tannins at this early stage. Medium bodied and a lovely Port wine. Deep brown colour with greenish hints. Complex and powerful nose, dominated by the strong presence of the dried fruits and spices, combined with a subtle and refined note of vanilla. In the mouth it is concentrated, silky and engaging. A wine with an irreprehensible structure, great character and an apotheotic finish. The Burmester 30 Year Old Tawny is a classic wine of exceptional quality and elegance. This is a wine of exceptional quality and elegance, a Casa Burmester classic that is made from a single harvest - a "Vintage Tawny" - aged in small 550-litre oak barrels in our Vila Nova de Gaia Cellars. It is bottled, at the very least, after seven years and in accordance with demand. This is a wine of exceptional quality and elegance. Colheita ports are made from a single harvest - a "Vintage Tawny" - aged in small oak barrels. It is bottled, at the very least, after seven years and in accordance with demand. It is ruby red with notes of blackberry jam, plums, raisins and exotic woods. Black cherry flavours on the silky palate with supporting tannins and a touch of methanol on the finish. This Burmester vintage port from the outstanding 1963 vintage is now at its peak. As well as still having admirable sweetness and concentration, it has a wildness and richness about it. A tremendous finish that goes on for ever reveals its superb quality.